Creatopath | /cre-ate(8)-oh-path/ (noun) 1. A method of inspiring a dormant mind using food, books, paper, embellishments, paint, material and thread. Dying for Cake is Brisbane author Louise Limerick’s first novel and has The Australian Women’s Weekly Great Read sticker on the front. And a great read it was! The title caught my attention straight away and I couldn’t put it down. “Life has taken an unexpected turn for the women in a mothers’ coffee group. Baby Amy has disappeared, and her mother, Evelyn, broken and distant in a psychiatric hospital, won’t utter a word. All of the characters where intriguing and each had their own problems to deal with as well as trying to help Evelyn out of her trance so she would open up about what had happened to her baby. Plenty of twists and turns and an interesting ending! It’s the 28th Challenge for Flash Fiction for Aspiring Writers hosted by Priceless Joy! Thanks to Dawn M Miller for the lovely photo. As Tamara jogged through the rainforest she became aware that someone was close behind her. The hairs on her arms bristled as she felt their breath on the back of her neck. A hand touched her shoulder. Startled, Tamara turned around. She glanced at the woman who had tapped her, then took a step back, scanning the area for help, if need be. The woman, dressed in a metallic black suit was staring at Tamara and when Tamara gazed into her eyes, it was like looking into a mirror, except she had black hair, not blonde. Standing beside her was a young girl, about six years old. Tamara gasped, barely able to contain her grief, as the girl resembled her own daughter who had drowned when she was two years old. The woman spoke and Tamara was shocked to hear her own voice. As Tamara crossed the bridge, the serene rainforest faded away and Tamara found herself in the hustle and bustle of a parallel universe. Click here for more flash fiction. From the 22nd August to the 28th August it was Book Week and many school students celebrated by dressing up as their favourite character and participating in lots of fun literacy activities. My daughter dressed up as Hermione from Harry Potter. The theme this year was Books light up our World. We are celebrating Book Week next week with a movie day, bringing in our favourite book, bringing in our most unusual book, dress up day, writing competitions with sizzling starts, Indigenous Storytelling and a Spelling Bee Competition, so lots to look forward to. If you would like to see The Children’s Book Council of Australia’s Book of the Year Award Shortlist, click here. While away on a long weekend in Noosa visiting my husband’s sister and her family from London I managed to finish my book club book -The Rosie Project by Graeme Simsion. I loved it. It’s a light, humorous, easy to read story about Don Tillman, an awkward and straight to the point genetics professor and Rosie Jarman, a barmaid who is on a quest to find her biological father. Don Tillman is getting married. The Wife Project will solve that problem. He has designed a sixteen-page questionnaire to help him find the perfect partner. She will most definitely not be a barmaid, a smoker,a drinker or a late-arriver. Rosie Jarman is all of these things. She is also fiery and intelligent and beautiful. All the characters in the story have their own funny mannerisms and I laughed the whole way through, especially at Don’s inappropriate comments and awkward moments. I hope the movie goes ahead – would be great to watch. I’m not sure what our next book will be – possibly “To Kill a Mockingbird”. What’s everyone else reading at the moment? Frantic, Velma scanned her crowded shelves, studying every little bottle of herb, spice and potion. Nothing rang a bell. Almost in tears, the final ingredient appeared before her. Velma poured in the liquid and the water frothed and bubbled. She sucked up the potion into her pipette and gently squeezed open the mouse’s mouth. Thankfully, within seconds the mouse transformed back to its regular form – Velma’s daughter. Click here to read more flash fiction. I would like to say sorry, it’s taken me so long to write this post and thank you to Francesca from A Smith’s World for nominating me for these awards (Versatile Blogger, Real Neat Blog Award, and the Premio Dardos Award). If you are given a magic seed, you can throw it in the ground and it will grow whatever you want, what would it be? A 3-course meal tree – no more cooking dinners! Things that make you tick? Helping others, creating things. Things that drive you to reach your goals. My kids and wanting to succeed. 5. What makes a good day? Getting things done, lots of laughter and hugs, a bit of reading and a bit of writing. Thanks Rochelle for hosting Friday Fictioneers and to Stephen Baum for this week’s photo prompt. As Ollie’s eyes adjusted to the dark he could just make out a large tank of leaves and twigs. Suddenly, a large hairy body scurried in front of his face. Ollie screamed and stumbled back, crashing into another glass tank. He spun around and saw hundreds of tarantulas. Ollie felt the colour drain from his face. At the bottom of the tank was the treasure he’d been searching for. Slowly, he placed his arm into the tank and slid the coins up the glass. Job completed, Ollie bolted towards the exit and tumbled out into the moonlight. Thanks to Lyndal at Delia Writes for inviting me on the IC Blog Tour. I have been following “Delia Writes” for some time now and her exciting journey to self-publication. 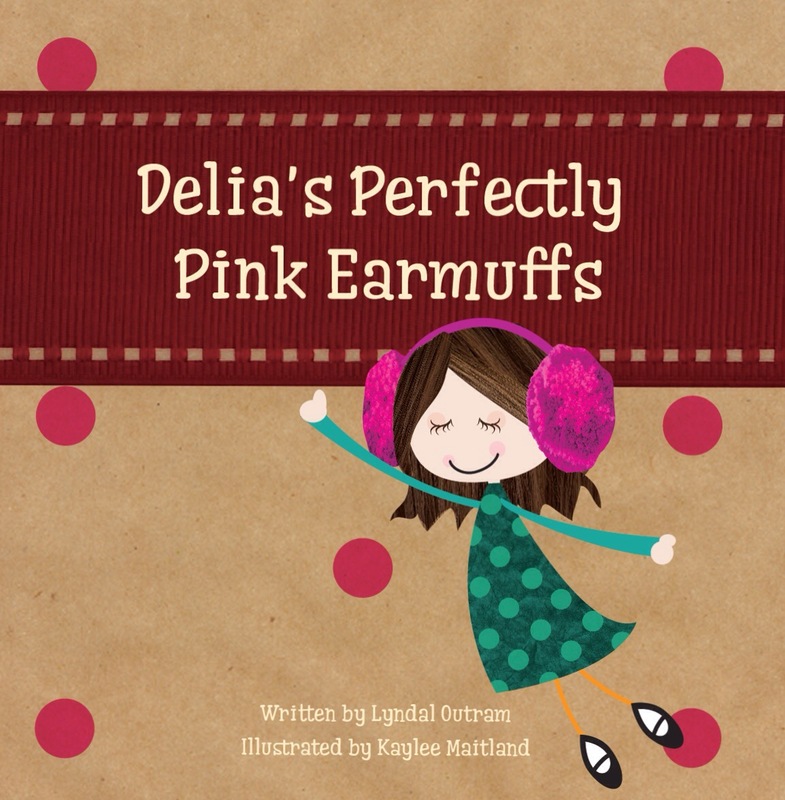 “Delia’s Perfectly Pink Earmuffs” has now been published and printed and is a gorgeous children’s picture book. The IC Blog’s focus is ‘A great way to elevate meaningful conversation and connections!’ For more information about Insightful Communications Publishing click here. Below is a set of questions I have answered, that I hope will assist in the writing journey. 1. What are your tips for creating meaningful content? I have a little notebook that I write down quotes, ideas, things that I read or hear on the news or in a movie or things that my friends/family say that might fit into one of my stories one day. A few years ago I participated in Katherine Battersby’s How to Write a Children’s Book and I also participated in Blogging 101 where I learnt new skills about blogging and writing. Every year I attend the CYA conference in Brisbane to listen to authors tell their story of what/how they write and their journey to publication and as well as meeting lots of lovely authors, I always pick up lots of tips and new ideas. 2. Books: Everyone has a story, some a book. If you’ve written a book, what was your creative process? What encouragement would you give others just beginning their book writing journey? After I’d written a couple of children’s picture book manuscripts I sent them to an editor for a manuscript appraisal and she was very helpful, informing me about the structure of a picture book and what she liked/disliked about my stories. She said, “You’ve got some really good ideas, you just don’t know how to write.” I was horrified at first but these were my first attempts so I worked hard to improve them. I then started entering stories in writing competitions – the feedback is invaluable and after a few years it was great to achieve a first place, second place and third place – built up confidence and encouraged me to keep on going. I also submitted stories to anthologies and magazines. There’s always somebody looking for flash fiction, poems, short stories and there are loads of writing competitions out there too. I try to attend writing courses, book launches and author talks whenever I can. I have found that a lot of these are free through my local libraries. 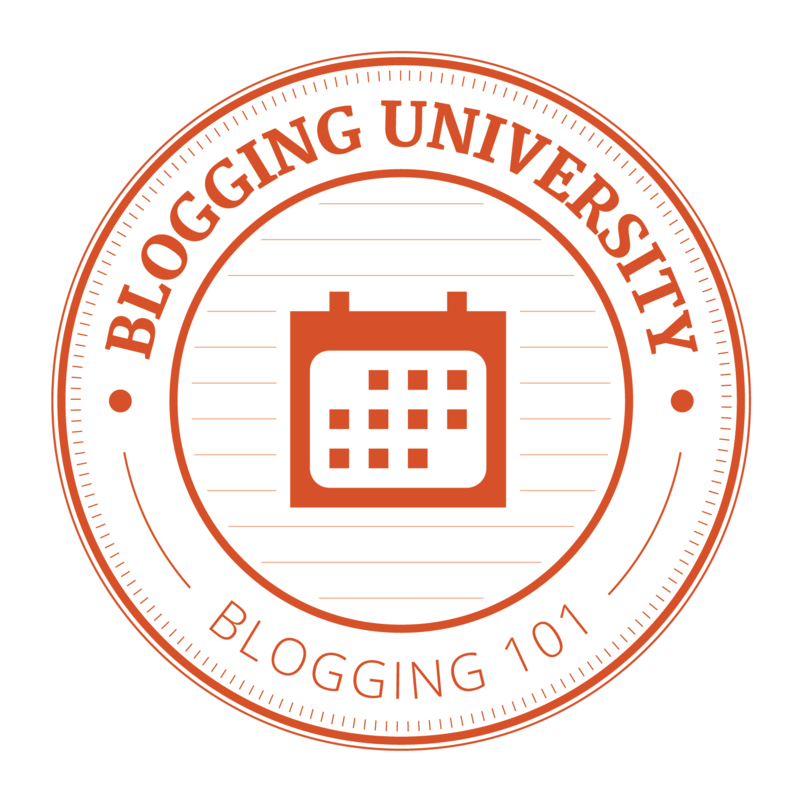 Following other writers’ blogs is another way to learn new things and stay in touch with what’s going on in the world of writing and publishing. I’m also a member of Creative Kids’ Tales and they have competitions, tips for writing and highlight emerging authors and illustrators. Lastly, every year I submit one or two stories into the ASA Mentorship Program Award, hoping to be allocated a mentor to help me get my story up to a publishable standard. 3. What advice would you give your younger self? Don’t give up – keep on writing. Even if nobody else ever reads it, it’s still fun and creative and I know my kids love my stories anyway!! 4. What are you working on now, and how can we, as a community, help? I am still working on my junior fiction chapter book that I started 3 years ago and I’m also having a go at writing a YA novel (started it last November during NaNoWriMo) and hope to finish it this November. I’ve been thinking about applying for a grant so I can do a paid mentorship program so if anyone has any tips about applying for a grant I’d love to hear about them. Thanks for reading. If you’d like to join the tour and inform people about your writing please do and link back here. If you’re looking for beautiful handmade things have a look at Tabitha’s blog, The Sewing Nook, She is very talented and crafty and is always making adorable bags, hair accessories and bunting. 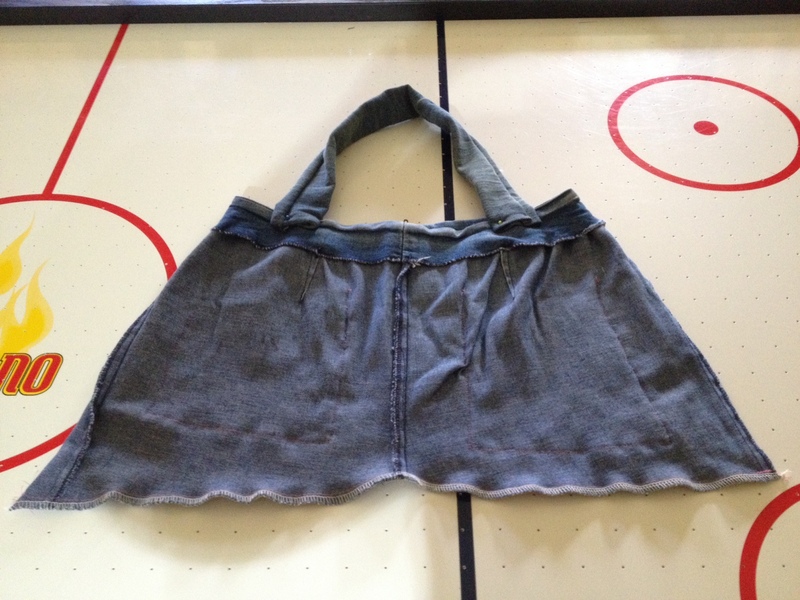 In her post “A sneak peak and re-purposing jeans” she used scraps of denim to make a gorgeous purse and cosmetic bag. 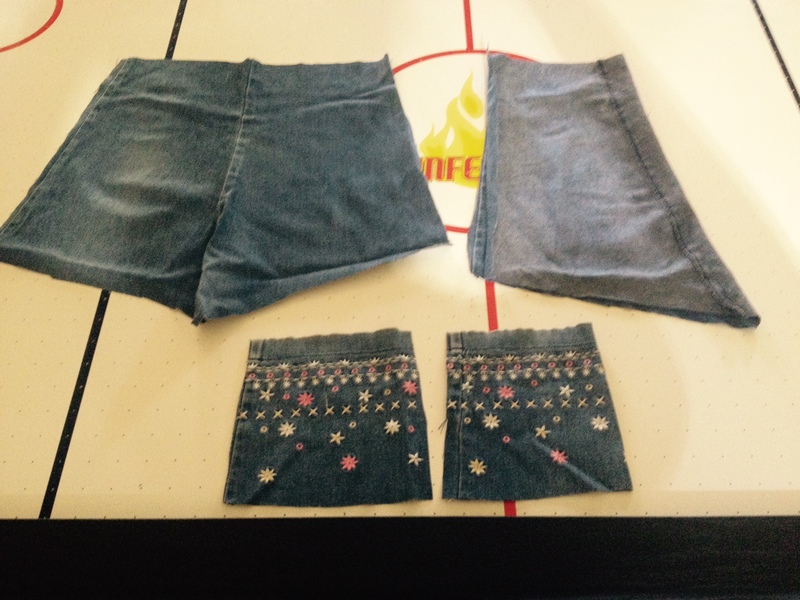 During my time off I cut up two pairs of old denim jeans (from the op shops) and made two handbags, a denim skirt for my daughter and a denim skirt for myself. I haven’t finished the two skirts yet or my handbag, however, the handbag I made for Miss 9 is complete. 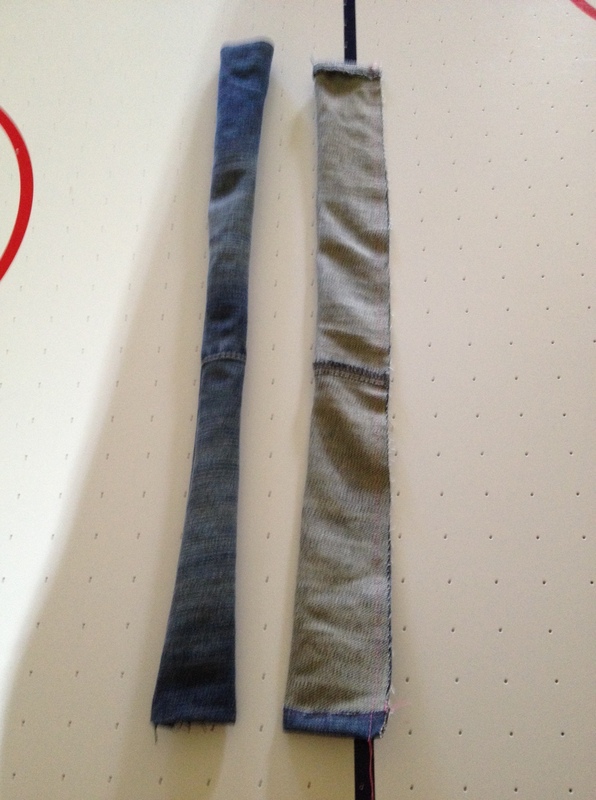 * First of all I cut the legs off the jeans (just under the zip). The top halves are easily turned into handbags (side seams are already sewn so it’s just the bottom to sew up and you can decorate with pockets/flowers/stripes etc and add the straps). * The material from the legs was used to make the skirts. 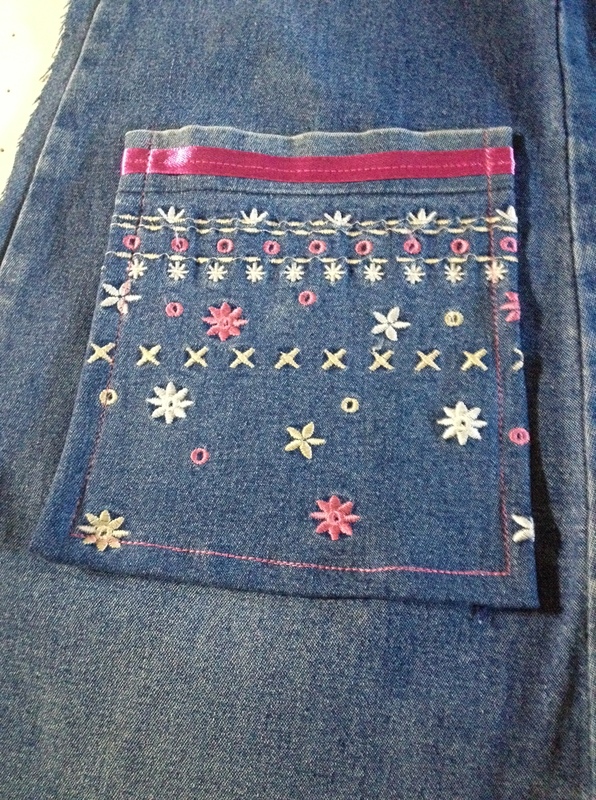 * I cut off the pretty floral embroidery at the bottom of the jeans to make pockets for Miss 9’s handbag and pockets for Miss 5’s skirt. 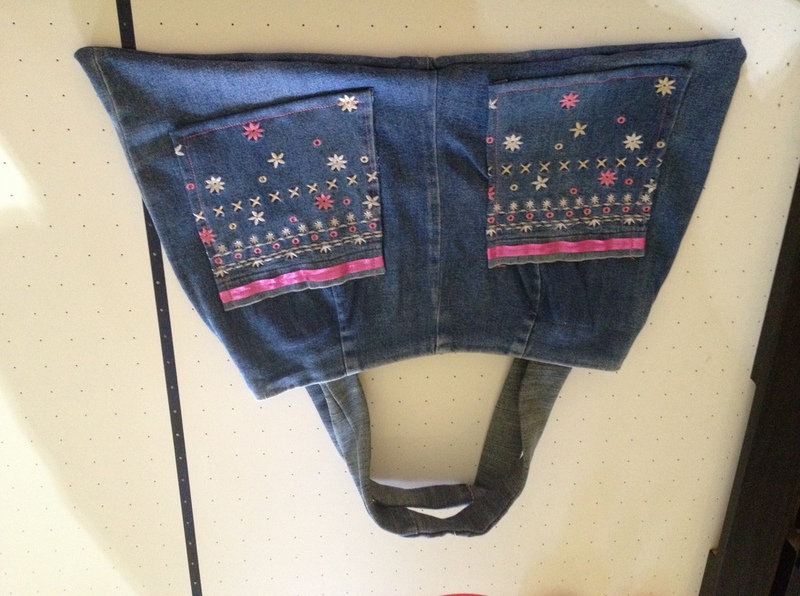 * I neatened off the edges to make the pockets and added some pretty pink ribbon, then attached the pockets to the front of the handbag. * Then I turned the bag inside out so right sides were together and stitched up the bottom. 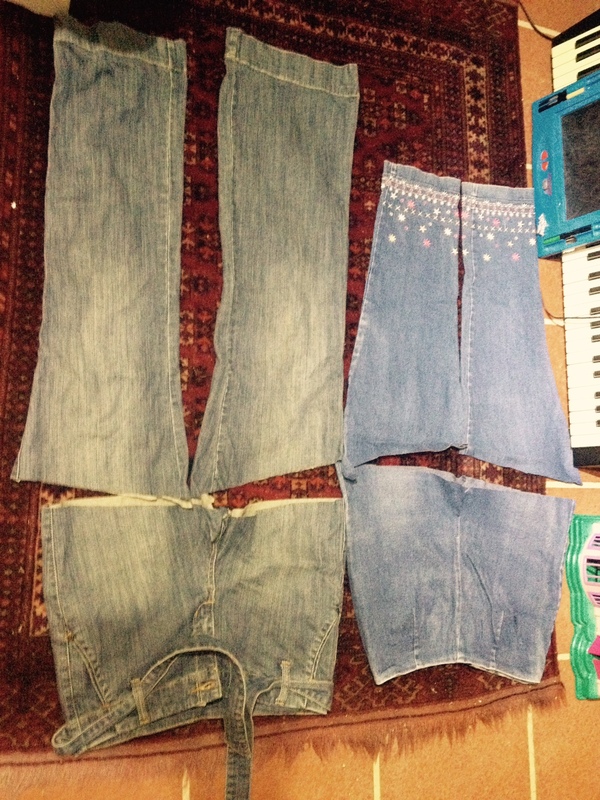 * Using material from the legs I cut 4 long rectangles to make the straps – sewed them right sides together and then turned them back in the right way to sew to the inside of the bag. * And… Voila! Miss 9’s bag was ready. She loves it and has taken it to the movies a few times as it’s big enough to hold a water bottle, snacks and a small cardigan. Now to finish my handbag and the two skirts!! What crafty creations have you been making? Thanks to Priceless Joy for hosting Flash Fiction for Aspiring Writers and to Sonya for the photo. No one really knows what happened to Mr Kendall, the eccentric old man who lived in the big mansion on the corner, but there was certainly a lot of speculation. Some say the devil possessed his body and mind and he stabbed himself to death in a fit of rage. Others say he was murdered in his sleep by his treacherous family, in order to steal his large inheritance. They say that some nights, especially when the moon is full, you can see the ghost of Old Man Kendall, wandering aimlessly through the graveyard, his arms held out in front of him, caressing each gravestone with his bony fingers, searching….